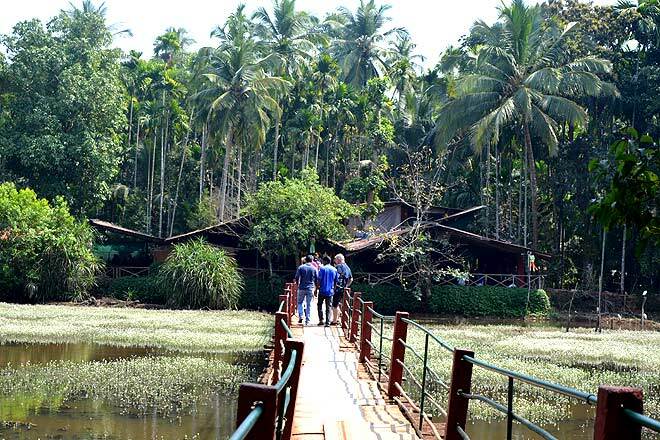 On a sunny day in Goa, a visit to a spice plantation can bring about the desired coolness, while also letting one relish some local food and explore the spicy goodness of nature. The bright tropical sun mellows a little under the shade of the many trees that stand here. The comparatively cooler temperature inside is a respite from the scorching heat that is always blazing the Goan grounds. Bright and shiny as days are in this coastal state, a visit to a spice plantation can be a welcoming break while on a beach holiday here. On the western coast of India, Goa is an year-round tourist hot-spot. Popular for its beaches, party scene, and night life, the state also has a calmer side to it. One can relax, discover and indulge at the spice plantations in Goa, which are all within 30-50 km from Panaji, the state’s capital. About 30 kms from Panaji, the Tropical Spice Plantation is set in Ponda, an even greener nook of this nature packed state. As tourists enter here, seeking shelter from the sun, they are welcomed in a traditional and refreshing way! While a host presents garlands, another serves kokum juice or lemongrass tea, gearing the visitors for the plantation walk and prepping their tummies for the big, delicious meal in the house. 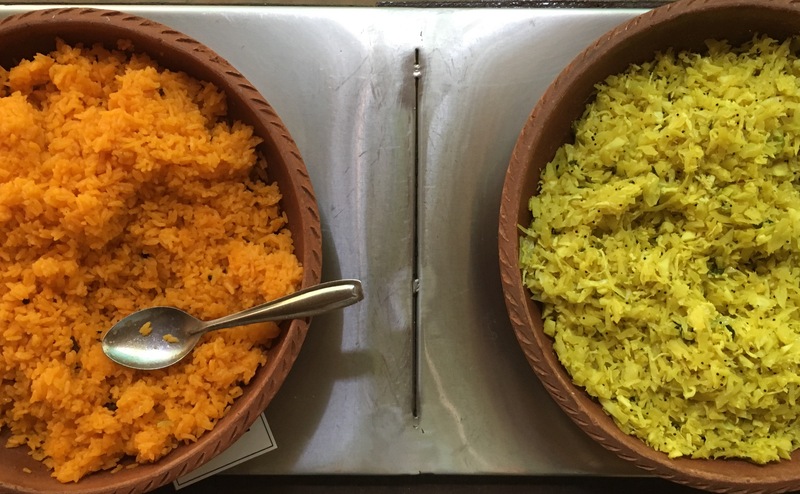 Before one sets into the green abode, an authentic Goan meal awaits them. Traditionally prepared fish, rice, breads, curries, sweets are in the buffet, which is as colourful a treat as delicious. A sumptuous, filling meal is best ended with a stroll; and nothing quite like taking one in a spice plantation. The Tropical Spice Plantation is home to varied types of plants and trees, which one can befriend or get to know about in detail by taking a guided walk. There are plantations of vanilla, nutmeg, cardamom, pepper, chilli and turmeric sharing space with each other and adding to the delight of the visitors who come to meet them- many for a first time. It can be pretty interesting to note the astonishment on people’s face, when they see these common ingredients in their raw form. After all, it is not common for one to peel off cinnamon from its bark or see black pepper in the stage when it is still green! This after-meal-stroll can actually be very informative as the guide talks in detail about the various plants and spices. The visitors are explained about the growing procedures, the various stages of blossom, best times of harvesting, health benefits and more. The walk can be particularly enlightening, as one gets to know about the goodness of the ingredients they have been spicing up their meals with so far. The tour is not too long but enough to disseminate all the information and take questions from a curious mind. At the end of the walk, drops of water are trickled down the backs of visitors, to help them feel relaxed. This would be the end of the tour for the ones who’ve had their meals before-hand. For the ones who chose to keep it for later, now know where the spices in their food came from! One can also take home some freshly sourced spices. Small packets of these can be brought at reasonable prices. There are also bottles of fresh and organic coconut oil or aloe-vera gel to add to the shopping bag. For the ones seeking some adventure at a spice plantation, visit the Sahakari Spice Farm, where guests can witness the art of tree climbing. Men with the local skill of swinging to and from palm trees set the stage and also offer it to the ones who might want to try their hands and legs at it! For the ones who’d rather not, an elephant ride is a safer choice. There are other spice plantations too, like the Sai Herbarium, Sacred Groves of Bambar, Savoi Plantations, Rustic Plantation, Parvati Madav Park Plantation, all of which have a little twist of their own in terms of touristic offerings. Nevertheless, befriending nature and indulging in authentic food remain common choices.